[W]hen reanalyses occur, they are not always in the direction of simpler grammars overall but rather are often complicating, in a global sense, even if they are simplificatory in a local sense. [T]he grammars linguists construct . . . ought to be allowed to reflect uneconomical "solutions", at least in diachrony, but also, given the relation between synchrony and diachrony argued for here, in synchronic accounts as well. 3 low contact situations are likely to lead to preservation of existing complexity. ・ Trudgill, Peter. "Contact and Sociolinguistic Typology." The Handbook of Language Contact. Ed. Raymond Hickey. 2010. Malden, MA: Wiley-Blackwell, 2013. 299--319. Not only are areally-determined distributions frequent and widespread, but they constitute the essential explanation for the introduction of innovation in many cases. ・ Drinka, Bridget. 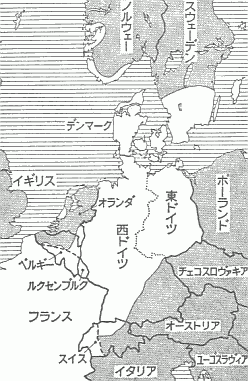 "Areal Factors in the Development of the European Periphrastic Perfect." Word 54 (2003): 1--38. It is here, then, in Parisian French, that I would claim the innovation actually began. In the 12th century, the OF periphrastic perfect generally had an anterior meaning, but a past sense was already evident in vernacular Parisian French in the 12th and 13th c., connected with more vivid and emphatic usage, similar to the historical present . . . . During the 16th c., perfects had already begun to emerge in French literature in their new function as pasts, and during the 17th and 18th centuries, the past meaning came to replace the anterior meaning completely in the language of the French petite bourgeoisie . . . .
My claim, then, is that the actual concept of HAVE periphrasis owes its existence largely to the Greek model, that the development of the HAVE perfect in Latin is tied closely to that of Greek, that it arose especially in literary contexts and in the language of educated speakers, and continued to be connected to the formal register in its later history. As a result of this learned calquing of the HAVE perfect from Greek into Latin, including ecclesiastical Latin, the Western European languages were, in turn, given a model to aspire to, a more elaborate temporal-aspectual system to imitate. The Romance languages, of course, all inherited these perfect structures, and, as I will argue elsewhere, most of the Germanic languages appear to have developed their HAVE perfect categories on the basis of this elaborated model, as well . . . . What is particularly fascinating to note is that the western languages have preserved and innovated upon this pattern to different extents, but continually show patterns of areal diffusion as these innovations spread from one language to another. ・ Matras, Yaron. "Language Contact." Variation and Change. Ed. Mirjam Fried et al. Amsterdam: Benjamins, 2010. 203--14. ・ Weinreich, Uriel. Languages in Contact: Findings and Problems. New York: Publications of the Linguistic Circle of New York, 1953. The Hague: Mouton, 1968. ・ Miller, D. Gary. 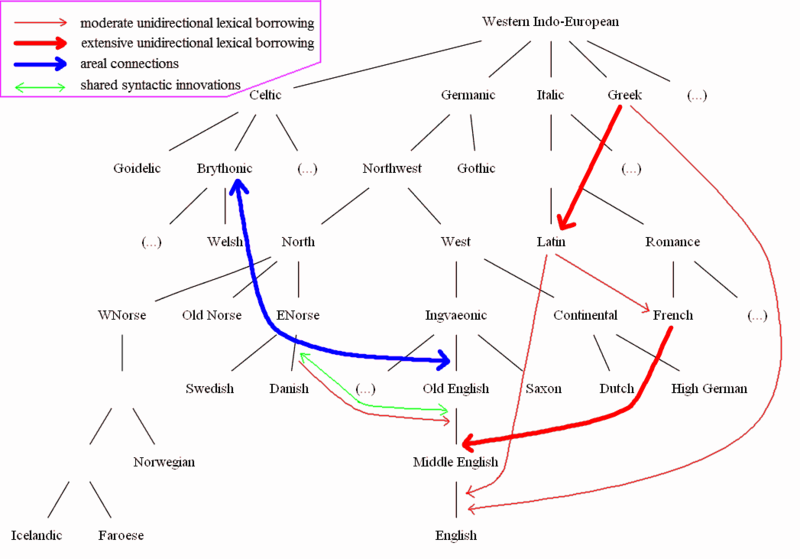 External Influences on English: From its Beginnings to the Renaissance. Oxford: OUP, 2012. A very tentative hypothesis thus emerges regarding the different types of linguistic items and their relations to society, according to which syntax is the marker of cohesion in society, with individuals trying to eliminate alternatives in syntax from their individual language. In contrast, vocabulary is a marker of divisions in society, and individuals may actively cultivate alternatives in order to make more subtle social distinctions. Pronunciation reflects the permanent social group with which the speaker identifies. Comparing relatives --- comparing languages which are descended from a common 'parent' --- is the oldest and most reliable method, but it cannot go back very far: 10,000 years is usually considered its maximum useful range. Comparing areas --- comparing similar constructions across geographical space --- is a newer method which may potentially lead back 30,000 years or more. Comparing resemblances --- comparing words which resemble one another --- is a highly controversial new method: according to its advocates, it leads back to the origin of language. ・ Aitchison, Jean. The Seeds of Speech: Language Origin and Evolution. Cambridge: CUP, 1996.